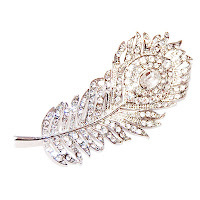 Our Jolie Peacock Feather Brooch, £14, adds a quirky touch, whether it's worn by the bride or bridesmaids. We love feather jewellery and think it looks beautiful in a bridal context. This brooch, in particular, provides a subtle look with gorgeous silver and shimmering crystal. The Brigitte Crystal Bridal Necklace, £30, is an absolutely stunning, statement bridal piece. This necklace is for starlets who want to stand out and have all eyes looking at them (no shrinking violets here!). 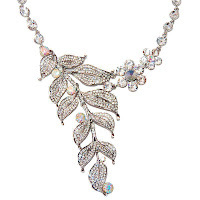 We love the unusual leaf design, the amount of crystals and jewels is insane! The darling of our updated Bridal Collection is the Luxur 1920s Bridal Headpiece, £60. 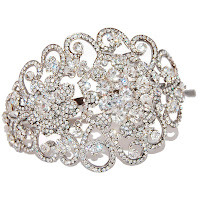 We completely heart this close-fitting, crystal, side hairband. Inspired by the Art Deco and Charleston age, the crystal ornament fits beautifully and makes a glamorous, vintage statement.